A side hustle business isn’t just a way to make a few hundred extra a week but a way to protect your future and reach that financial independence. Most people don’t yet think of a side business as a necessary part of your financial plan but it won’t be long before it’s a reality. Not only will creating a side income help you reach your goals, it will help you protect your income. By the end of this video, you’ll have ten great side hustle ideas you can pick from to make money every single day. 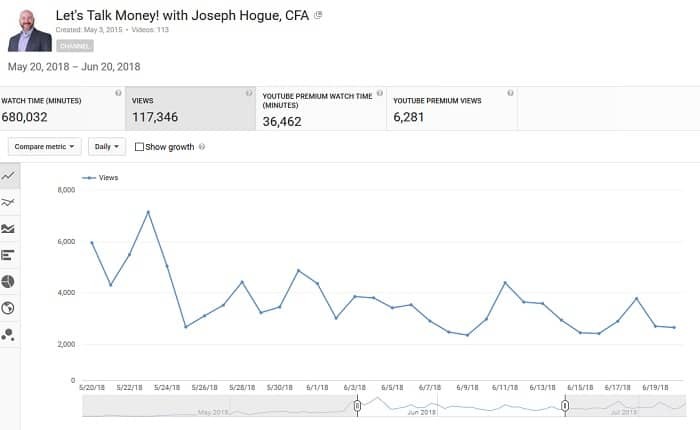 We’re creating the financial future you deserve on the new YouTube channel. If you want to finally beat your debt, learn how to make more money and make your money work for you – click through to join the community. Join the Let’s Talk Money Community – it’s Free! Do You Need a Side Income? Everyone loves to talk about side hustle ideas and making passive income as a way of making a little extra cash but there’s another very important reason you need to be setting up your own side hustle business. Freelancing or independent work has exploded over the last few years with more than 60 million Americans already working for-hire. Companies are lovin’ the trend because they don’t have to pay a lot of the benefits and taxes…soooo it might not be long before freelancing is the way everyone works. Getting your side business started now is going to make you ready when the shift happens. Even if you’re not worried about the coming jobs-pocalypse, starting a side hustle idea is just a great way to reach that financial freedom, a way you can make a little extra to reach your dreams faster and not have to live paycheck-to-paycheck. The most common question I get about starting freelancing is where to start, how to find that perfect side hustle strategy you can use to turn five hours a week into a few hundred dollars. So I’ve taken all the income sources I know and narrowed them down to my favorite ten. 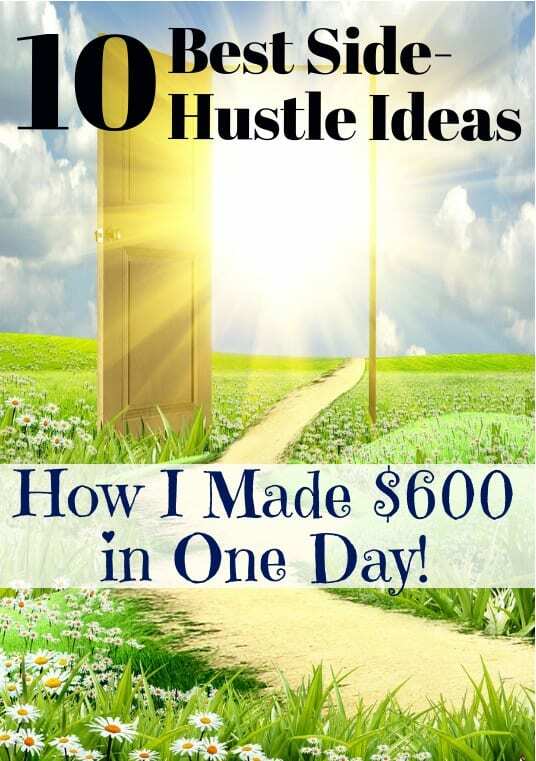 I’ve used six of these side hustle ideas and make money every month from at least four. In fact, I made over $7,200 in March with $600 in one single day. Your monthly income is going to fluctuate a little but put together a few of these ideas and you’ll produce a solid income you can count on. Now I don’t want you to expect something called ‘side-hustle’ to be easy. You will have to hustle on some of these ideas but the income grows over time and some can become passive income in less than a few months. I built my online income to over two grand a month in a year and was making over $6,000 a month within three years. I tried to keep out the traditional jobs from the list, all the side jobs you see on Craigslist. Everyone knows you can make money cleaning someone’s house but do you really want to get pruny fingers 10 hours a week? For this list of side hustle ideas, I kept it to the income sources you might not have thought of, the ones that have worked for me and the ones that work the fastest. I’ll include how to get started and how much you can expect to make with each side income strategy. I’m also going to reveal three secrets to side hustle success, three critical keys to making money, at the end of the article so make sure you stick around for that. Our first side hustle idea is one of the easiest but one most people don’t think of because it sounds so official. Whenever someone signs a contract, they need a notary to witness and sign the document. Becoming a notary takes almost no time and you can make around $100 each time you witness a contract signing which takes less than half an hour. Once you’re a notary, real estate agents and other companies will ask you to come out to witness their signings. You can easily do three to five a week as a side hustle and make $100 a pop. Our next side hustle hack is a great way to get into real estate investing without any money or at least a smaller budget. I’ve been investing in property since getting out of the Marine Corps and I love it as a long-term wealth generator but this strategy also makes it a great side income. We’re talking about wholesaling real estate here and this is like acting as a middleman to buyers and sellers. You find properties priced below what you thing they’re worth and contract with the seller to buy the house within a month or so. You then set out to find someone that will buy the house from you at the same time but for a higher price. So no money or maybe just a few thousand in earnest money has been exchanged when you sign the contract with the seller. The earnest money from your buyer more than offsets this so you really don’t need a big bankroll to get started here. You set up the closings to happen at the same time so you might only actually own the property for all of five minutes before signing it over to your buyer. I recently interviewed Sharon Vornholdt for a future video that says she makes between $5,000 and $10,000 a property and you can do several of these a month. I would recommend getting familiar with real estate investing, maybe through a few flips or rentals first but this is going to give you the experience you need to spot great deals that you can instantly resale. That wholesaling side hustle idea is big time but this next one you can set up and get started in a day, teaching English online. I did a test run of a few sites and was assigned to students and making money in less than a week. It helps to get a little training first but any native English speaker can learn how to teach in less than a day and there is HUGE demand for this right now. You can teach independently through Facebook or Skype, getting students through a blog or marketing, or you can just sign up to one of the dozens of sites like Preply, Verbling and Tutor.com. All of these sites are legit and will give you as many hours as you want. For a 30-minute session, you’ll make between $15 to $50 and most students will need three to five hours a week so you really don’t need a lot of students to have a very respectable income. Those three keys to side hustle success I’ll share at the end of the video are really going to help this next idea, help you make money and avoid some of the biggest mistakes, so stay tuned for those. 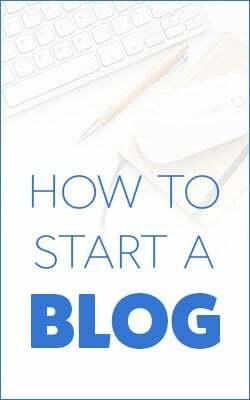 Next we have affiliate marketing and this one is going to work best if you already have a blog or another online traffic source but you can do it with just your social media accounts as well. In affiliate marketing, you sign up on networks like CJ Affiliates or FlexOffers. These are sites that connect companies with bloggers, YouTubers and other publishers. You sign up for a company’s affiliate program and get a link to their product. You can put that link in a blog post, in a Facebook or Twitter post, just about anywhere someone that might need that product will find it. If someone clicks on that link and then makes a purchase, you get a commission on the sale. Now there are some keys to remember with affiliate marketing to be successful. You only want to promote products that you use and that work really well. Pitching crap products just to make a buck will alienate your readers and friends. 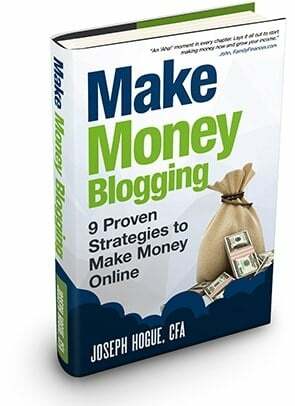 I use affiliate marketing as an income source and average around $3,000 a month through my blogs. Just like a lot of these income sources, it’s going to vary from month to month but it takes very little time and really adds up when combined with a few other side hustles. Our next side hustle is something I love doing but as a hobby more than for steady income. We’ll call this one flea market flipping but it’s really any reselling strategy buying at consignment, second-hand or wherever to resale on Craigslist or eBay. I interviewed Rob and Melissa of the Flea Market Flipper channel on YouTube about their full-time flipping strategy that supports their family. You might want to start with a specific product type like toys or a type of electronics or just any niche where you can get to know prices so you know immediately what’s a good deal when you see it. You can also use apps or the eBay site to find how much you can get in a resale. The best strategy seems to be finding like-new stuff locally at flea markets, thrift stores, and then reselling at the national level on eBay. Because you have that bigger market in which to sell, you can find people willing to pay more for your finds. I like doing this just as a fun weekend activity with the family rather than a full-blown side hustle business. We’ll go out on a Sunday to flea markets and some other places on our list, just looking around and spending time together. I can usually find one or two things in a couple of hours to resell online. This next side hustle idea still an interesting one even as some of the ride share companies run into problems in some cities but you can make over $20 an hour with apps like Uber and Lyft. What I like about working rideshare is that it’s so easy to do in your spare time. The apps work so that you can turn on or off your service any time and they’ll match you with fares. Rideshare site RideGuru looked at how much drivers made on a typical five-minute drive between the initial charge, metered fare and service charges. It came out to between $19.89 on Uber to as high as $26 an hour on SitBaq and $36 an hour driving a traditional cab. Here you’ll really want to follow some of our side hustle business rules I’ll go through later, like really treating it like a business and getting the deductions on your taxes. One of the biggest complaints about ride-share driving is the wear and tear on your car but you can still make very good money if you plan around things like this. The next side hustle business is a twofer, blogging and making money on YouTube. I do both of these and make the majority of my income from them. These are going to be great marketing for any of the other side hustle ideas but work well on their own as well. You can sign up for a Google Adsense account and put ad boxes on your blog or this is all pretty much automatic on YouTube once you get 1,000 subscribers. I make about $0.01 per view through both, on the blogs and on the YouTube channel which doesn’t sound like much but can be a solid source of income. 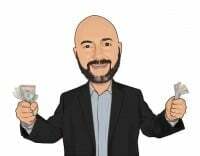 I get just under 70,000 visitors to the blogs each month and about 117,000 YouTube video views so that’s almost $1,900 a month not including all the free marketing I need for products or other business ideas. That traffic doesn’t happen overnight but you can easily be reaching tens of thousands of visitors within a year. Beyond the money you make on advertising, you can start getting sponsorship deals to talk about a company’s products. I get $500 a video to mention someone’s product here on YouTube and I know others that charge in the thousands of dollars for a sponsorship deal. 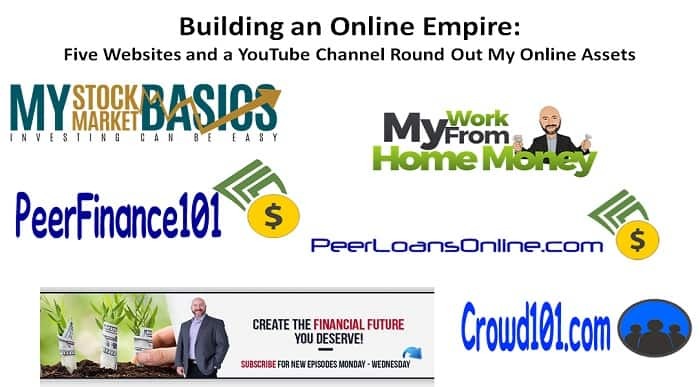 One income source I’m just starting to develop is through online courses. 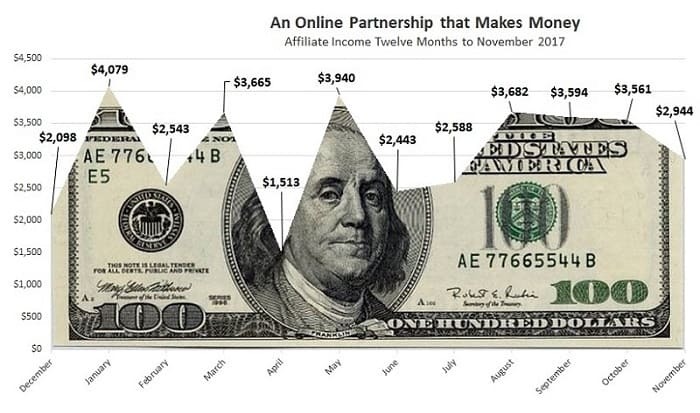 This is really the next evolution in your online income because you move from making money off other peoples’ products to making money on your own. Of course, the payout on your own course is much higher. I see other bloggers making between $350 to $1,500 every month on courses and if you don’t think you have anything to teach, think again. I mean look at some of these Udemy courses from creators, Rubik’s cube simple and easy, what to text a girl you like…that one’s a best seller, amazing. Creating a course is easy through sites like Teachable and Thinkrific and you can basically repurpose a lot of the material from your blog. Believe me talking about anything for a year and you’re going to become an expert and find out what people are looking for in the topic. That’s going to give you your business idea, then you can research other courses to see what other creators are saying and what you can add. For a typical 10-hour video course, expect to spend about 40 to 60 hours creating it but then making money every month for years. Making just $500 a month on the course over three years is eighteen grand and hundreds an hour on the time it took to create. This next side hustle idea is my favorite, self-publishing. This is basically the same as the online course we just talked about but a lot faster and easier. In fact, if you create an online course, you can take the transcript and use it as a book to do double-duty on your income. The same ideas apply here except you don’t need video skills. I published 10 books in just over two years through January 2017 and make just under $2,000 a month. I spend $200 a month marketing the books on Amazon but that’s absolutely it. The best part about self-publishing is that it’s almost completely passive income after you’ve launched the book. It’s super easy developing your book idea. Start with a transformation, something readers want or need, and then work back through the steps they need to get there. Each of those steps is a chapter in your book and you can publish each as a blog post. 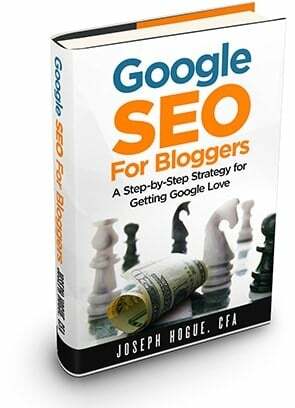 This is not only going to help you stay on schedule to finish the book but each of the blog posts will become easy marketing sources when the book is done, you just go back through and link your Amazon book page into the post. After you’re done, just format your book for publishing and get it on any of a dozen sites like Amazon, CreateSpace or Smashwords. You can easily do two or three books a year in your spare time and that means upwords of $600 a month as a side income. Our tenth side hustle idea before we get to those three success secrets is actually one I thought I was making up but there’s already a huge market for it. On sites like rent-a-friend.com you can actually sign up to be a virtual or in-person friend to someone. It may sound weird but it’s really no different than some of the other coaching or tutoring ideas that have worked for years. You’re basically just lending an ear and offering advice to someone for an hourly fee. Like the online tutoring idea, you can go independent on this one or join a site that will match you with people. The sites have some how-to content and rules so it might be easiest to start there to get a feel for it before going freelance. Either way, you’ll make between $15 to $50 an hour and get to set your own hours. Now that you have a solid list of side hustle ideas to work with, I’ve got three keys to making any of them a success. Odds are you won’t want to try all of the income sources or even that they’ll all work for you but these three strategies are going to help you make more money whichever you choose. First is that you have to treat it like a business. You can do any of these ideas with just a few hours a week but you still have to treat it like a business. That means learning how the business works and the different roles you have to play in each. For example, you’re not just writing books to publish. You need to be a marketer and a manager and an accountant too. These aren’t just side income ideas, they’re businesses that will create assets you can own and make money off for years. Learning what works in each of these income ideas, treating it like a business, will put you way ahead of all the amateurs out there and will make you more money. Second here is to get all the tax benefits you can. This is a big part of owning your own business and a lot of the return. Small businesses might not make a lot of money month-to-month but taking advantage of some of these small business benefits will protect your full-time income and really make a difference. First in this is to track your spending on everything. You can deduct from your income any spending related to your side business and that means you can protect some of your regular income from taxes as well. Even some of the money you spend on utilities and property taxes can reduce your income taxes. You also want to take advantage of a self-employed IRA plan. This is a special type of retirement investing account in which you can put your side hustle income and not have to pay income taxes on it until you retire. The contribution limit on this one is way above the limit you can contribute to other accounts like a 401K or regular IRA so it can be a great resource to avoid a lot in taxes. The last key to side hustle success is just to stick with it and consistency. That might not sound like a secret but you’d be surprised how many people start and stop their side hustles within a month or that flip from one income stream to another without really developing any. Your monthly income isn’t going to explode higher immediately from any of these sources but give it six months and you’ll produce an income stream that cash flows every month. Combine three or four of these with just five hours each a week and you can easily be making three or four thousand a month within a year. That’s a full-time income on just part-time work. Few of these side hustle ideas will make you rich but put a few together and you’ll create your own businesses, your own assets that will make you money every single month. 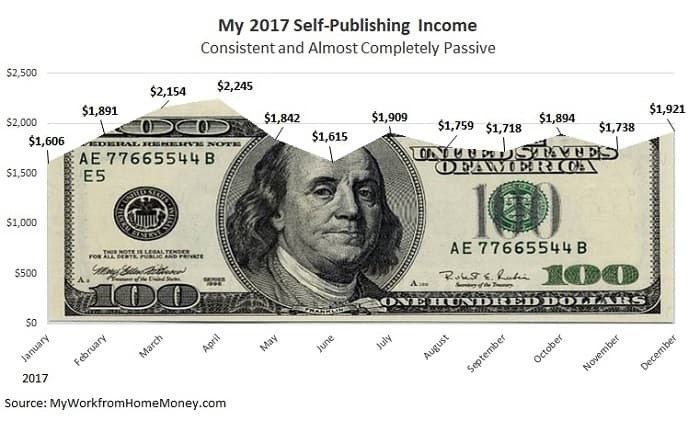 That monthly income may jump around a little, the day I made $600 was followed by a few days of making only a few hundred but it averages out to an amazing income. Pick and choose which income sources you like, take the time to learn a little in each and you’ll have a thriving side hustle business in no time.